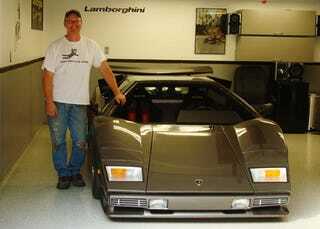 Last week we brought you the story of Ken Imhoff, a Wisconsin man who, after falling in love with the Lamborghini Countach in the classic movie Cannonball Run, followed his dream by building his very own Lamborghini in his basement. The amazing build took place over the course of ten years and was completed and dragged out of the subterranean depths only about a week prior to our story. That very same day Ken contacted us, amazed by the response the post had garnered, to let us know "I am the guy with a Lamborghini in the basement." Of course we knew you needed to hear more, so over the last week we've been working with Mr. Imhoff to put together a story that will not only do justice to his car, but to his vision and persistence. Below is Ken's story in his own words, along with a load of new pictures of the finished car and details of the entire extraction process. What's most interesting to many may be the technical details — those too await below the jump in this exclusive detailing of one of the most amazing build we've ever seen. MSD box and billet dist. Brakes Wilwood Suprelite 4 piston calipers and 12"x1.25" rotors. Exhaust handmade 180deg. 2" S.S. headers, 3.5" collectors, 12" long x 3.5" racing muffers. Wilwood racing pedals/master cylinders/hyd. clutch.